I discovered this sandwich one night when we were having each of the separate components for dinner. Grilled chicken, hand-cut sweet potato fries with honey mustard dipping sauce, biscuits, and salad. I decided to shove everything onto a biscuit because..what’s the worst that could happen? Surprisingly, every flavor was complimentary to the next. Cook the sweet potato however you normally would. Since I’m extremely impatient, I tend to hit the potato button on the microwave, which cooks a potato in 4 minutes as opposed to 45 minutes in the oven. To me, the only downside of not using an oven is that the skin doesn’t get quite as crispy. Once the sweet potato is cooked, scoop out the insides with a spoon and mash with the back of a fork in a small bowl. Set aside. Whisk together the honey and the mustard in a ramekin. Thinly slice the avocado half. To assemble, toast the bread, then spread some sweet potato mash on top of it. 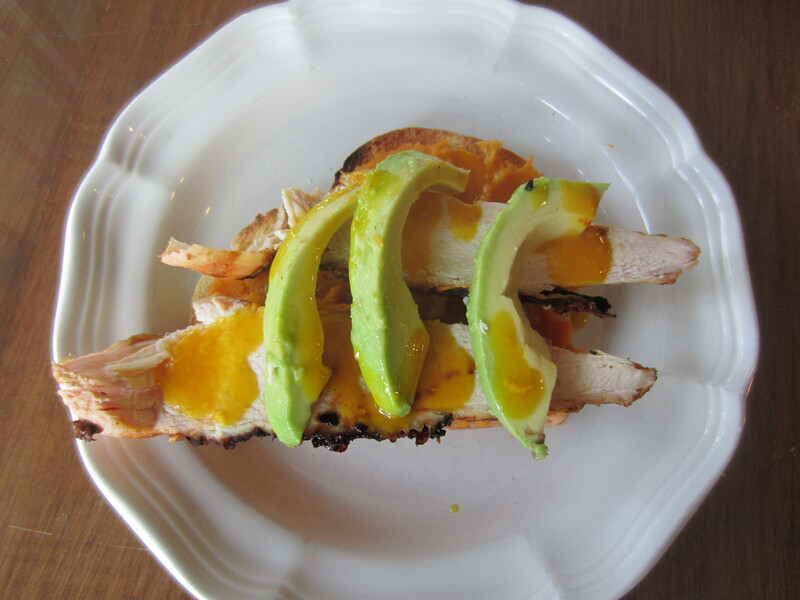 Top with half of the chicken breast and a couple avocado slices, then drizzle with honey mustard.